If you’re visiting this page, chances are it’s because you’re either a new cigar smoker, or you’re looking to buy a cigar for a friend or a special occasion. You may be standing in a cigar shop with your smartphone out or doing some research before purchasing online. There’s no one right answer, but there are some important tips. For each tip, I’ll also offer a number of cigar recommendations based on my personal experience (including price and cigar strength). For purchasing online, I’ve linked out to Famous Smoke Shop, which I consider the best cigar retailer on the market today. As much as a cigar salesman might hate to hear me say this, you don’t need to spend more than $10 to get a great cigar. There is a glut of wonderful cigars in the $10 range. In the last two decades, there has been a ton of innovation in the cigar market, and that has led to a market full of great product. Brands like Rocky Patel, Camacho, Arturo Fuente, San Cristobal and more have great regular production cigars on the market in the $8 – $12 range. There have also been great value releases like the Casa Magna Colorado (retails for around $8), which won Cigar Aficionado’s #1 Cigar of the Year in 2008. Arturo Fuente Don Carlos Double Robusto ($10, medium): one of the best cigars from Arturo Fuente, the Don Carlos features extremely smooth and silky flavors of coffee, vegetal notes, white pepper, and spice. Oliva Connecticut Reserve ($8.50, mild): One of the best mild to medium bodied smokes you’ll find under $10 . Creamy, smooth, and slightly sweet with notes of cedar, nuts, and hints of pepper. The Tabernacle ($10, medium-full): The Tabernacle is just a beautiful smoke. It serves up some of the deepest, richest flavors and is in my top 25 of all time. Expect notes of chocolate, white pepper, toasted bread, and cedar. A.J. Fernandez New World Puro Especial ($9, full): a breakout cigar which won many cigar of the year awards in 2017. Clocking in at $9 a cigar, expect creamy, smooth smoke, with balanced flavors of earth, cedar, cocoa, and cinnamon. The $5 price point does still have some gems, but for the most part you’ll be settling for less if you are only willing to spend $5 on a cigar. It would be great to say that every price point has the best cigars in the world available to it. But that just isn’t true. If you’re purchasing for yourself, you can safely ignore this advice. Smoke what you want! But, if you’re purchasing for a special occasion like someone’s wedding or bachelor party (and haven’t already spent a fortune on it), shoot for at least the $7 – $12 range. Perdomo Lot 23 Maduro ($5.75, medium): a rich, dark smoke with lots of cocoa, earth, and espresso notes. Very smooth and a favorite for many smokers. Arturo Fuente Hemmingway Short Story ($5.95, medium): a true classic from the Fuente family, and a favorite short smoke for many cigar smokers. It just also happens to be incredibly affordable! Camacho Connecticut ($6, mild): the Camacho Connecticut is one of my personal favorites. Extremely smooth but with nice body – nutty, with cedar and a bit of cream. Always a great draw and good construction, and always in my humidor. If you aren’t fazed by paying $10 or even $15 a cigar and are looking for some of the more legendary smokes on the market, I’ve listed a few below. They range in price from around $20 to $30. These are spectacular, the kind of cigars you buy when you are having a child, when your childhood friend is getting married and you are best man, or when you’ve just closed a massive business deal. These are not only celebratory cigars, they are legendary in their own right. Arturo Fuente Opus X ($30, medium-full): Creamy, balanced notes of coffee, white and black pepper, and cedar. Davidoff Millennium Blend ($25, full): As the cigar develops, the strength increases consistently. The combination of coffee, cocoa, and spices with floral notes makes this a must-smoke cigar. Padron Anniversario 1926 Maduro ($17, full): A true classic, and found at most cigar shops. Deep and rich smoke, with chocolate and fresh roasted espresso notes. Careful though, there’s also a dry cedar aspect of this cigar that makes it enjoyed best with a drink on hand. Padron Family Reserve No. 45 Maduro ($27, full): similar to the 1926, but with a more concentrated flavor (also a bit less dry). Best enjoyed after a heavy dinner of steak, and not early in the afternoon. So there you have it, a run down on how to think about cigar purchases in light of price. As I mentioned before, there are great cigars in each category. There are, however, important and substantial differences between the best cigars in the $10 category and those in the $20 – $30 category. Whether or not those differences justify the cost is up to you. If you are just getting into cigars, I recommend starting in the $5 price range and working your way up from there so that you can appreciate the nuances of the cigars in the $20 – $30 space. One last note. Where you are purchasing makes a big difference on the price you’ll pay for these cigars. If you’re looking to purchase a cigar in Europe or Canada, for example, you might have to bump up your expected price range by about $5 or even $10 to get the same quality as a $10 cigar here in the states. If you live in the United States, it also matters which retailer you buy from. You’ll get better prices online than you will in a brick and mortar store. As mentioned earlier, I recommended Famous Smoke Shop for their ease of use, affordability, and overall quality of the experience over the years I’ve been purchasing through them. 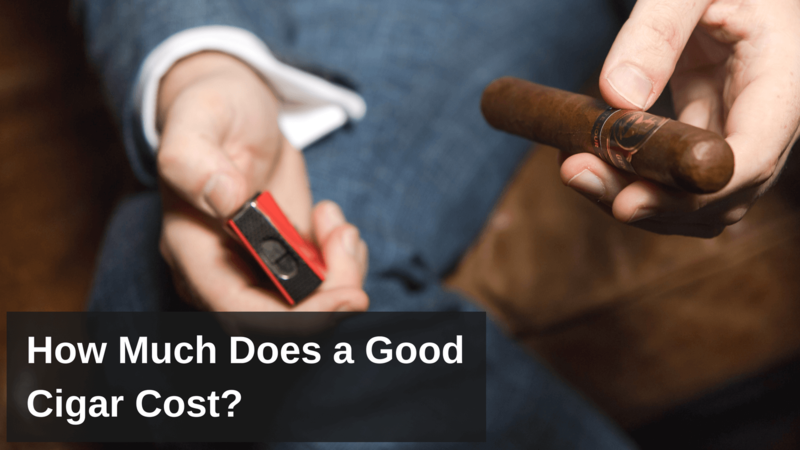 Do you have a cigar in the $5, $10, or $20 – $30 range that you’d recommend? Tell us in the comments section below! I am too cheap to spend a $5 bill on a cigar. I like the filtered cigars that come in a pack of 10-20 for a few bucks! Been smoking them for years here and there. Now that’s a good deal in my opinion. I normally stick with double diamond grape. Someone told me the other day that machine wrapped and filtered are just as bad as cigarettes with all the chemicals. I thought it was just like other cigars except filtered, is it really like cigarettes? Do they really have a bunch of added chemicals like cigarettes? If so, I’ll have to stop smoking them and find a cheap alternative that is not machine/chemically infused. I don’t inhale them like some people who use them as an alternative to cigarettes. great article to learn from it covers everything you need to understand around the cost of a cigar. My first go round amd I have learned a lot. Great article with sound advise and recommendations. I have enjoyed many of the brand’s mentioned. My favorite budget cigar is the Don Tomas Special Edition Connecticut with a average price of under $5. My favorite super premium cigars are the Padron 1964 maduro, Fuente Anejo’s, Davidoff Late Hour. My favorite all time go to cigar is the Kristoff GC series. It can be purchased for about 6 to 9 dollars.